I have been thinking about starting a blog for quite a while now, but have often wondered whether it would be too much work! So what better way to start it then to write about something else that is becoming quite some work. After my wedding last July, I was left with 47 table runners, numerous place mats and various scraps of really beautiful fabric. As many crafty types often do, I put a lot of time and energy into making our wedding look just right. I used Liberty Poppy and Daisy as the inspiration for the wedding, which I sort of accidentally picked up for a tenner at a shop in Stratford-upon-Avon. After choosing this as a theme, the rest of the colours just seemed to follow suit (and then I just had to add in some purple - my favourite colour). So, with all of these bits and pieces left over, a colleague suggested that I make a patchwork quilt to always remind me and my lovely husband of our special day. Here's said table runners in action! I decided to use the English paper piecing method to make the quilt, partly because I have never done it before but I also love the effect of the flowers and thought that it would compliment my specially chosen fabric well. I've made quite a few quilts on my sewing machine so was in the mood to try something more challenging. Despite being married for over 7 months, I have only really just got cracking with the quilt. 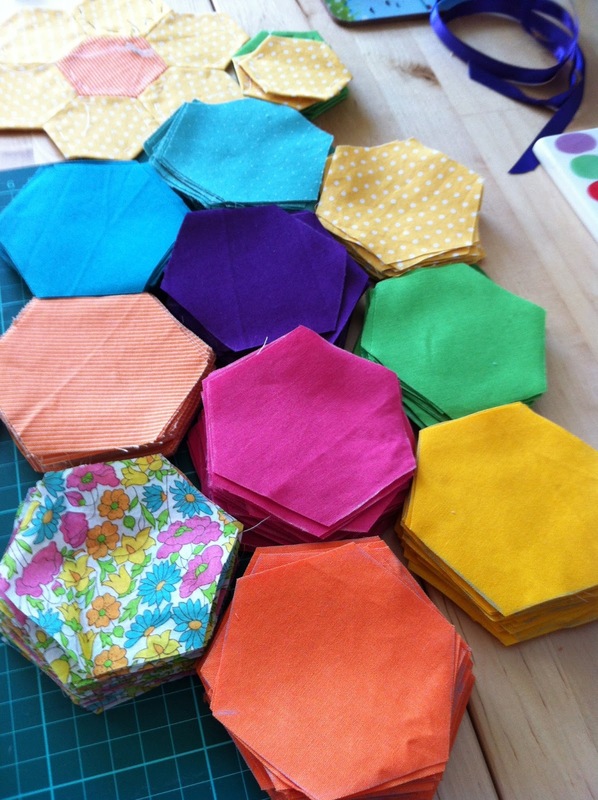 It took me an age to cut all of the hexagons out, both fabric and paper ones. And now I've made 9 flowers (Ok, 8 and a half...). Only 51 and a half to go, and then I'll be on to the cream border fabric and all by hand which is something I am definitely not used to. I've set myself a target of finishing the quilt for our first wedding anniversary, but despite the blog title suggestion, it may turn out to be more labour than love.